2016: Pavlik returned and played five AVP events with Sheila Shaw and two with Amanda Dowdy. She had a best of fifth with Shaw. Pavlik ended the year leading the Tour in kills (8.02 per set) and hitting percentage (.696). 2015: Due to injury Pavlik played just two events, finishing fifth with Jenny Kropp in the AVP season opener and 25th with April Ross on the FIVB Tour. 2014: Pavlik began the year with a pair of AVP events alongside Jennifer Fopma, with a best of third place. She then teamed up with Heather McGuire, and they reached two semifinals in their five events together, including a second-place finish in the season finale. On the FIVB Tour Pavlik and Fopma played seven times, with a best of ninth twice. She ended the year playing one tournament with both Nicole Branagh and McGuire. 2013: Pavlik teamed up with Kerri Walsh Jennings, and in their second event together the duo won in Manhattan Beach, marking the third straight year Pavlik had won that event. 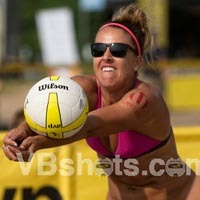 In the AVP season finale Pavlik played with Annett Davis, and ended the year with four semifinals in six tournaments. Internationally Pavlik played six FIVB events with four different partners. In the World Championships in Stare Jablonki, Pavlik played for the only time with April Ross, and the duo finished fourth. Pavlik and Jennifer Kessy ended the year by winning a bronze medal. 2012: Pavlik and Kropp continued their success domestically, winning six events plus a NORCECA tournament. They placed third in the two AVP events, and then lost in the country quota in their only FIVB appearance. 2011: Pavlik continued playing with Kropp, and in 15 tournaments across six tours, the duo won six times and finished second five times. 2010: Pavlik played the first two events of the year with Jennifer Fopma, then formed a partnership with Jenny Kropp, with a best of ninth three times in their five events. College: Pavlik began her collegiate career at University of Montana, playing there from 2002-2003. She transferred to UC-Irvine, where she was a libero and outside hitter in 2004 and middle blocker in 2005. Personal: Pavlik has an older sister, Lindsay, who played volleyball at Northwestern. The two sisters competed against each other in a match in 2002. Pavlik played at Mater Dei High School, which was ranked third nationally her senior season.